At St Joseph’s we have strong historical links with the local community that date back over 90 years. On 29 August 1927, St Joseph’s Infant and Elementary Schools opened their doors to 320 pupils. The building was situated on land, which had been given by the Marquis of Bute to the Institute of Charity (Rosminians). 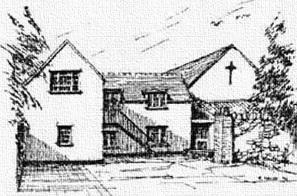 Parishioners worshipped in the adjacent temporary tin church and the priests lived in a neighbouring end of terrace house in New Zealand Road. A permanent church was opened in 1936 and the present presbytery built later. In the 1950s with the reorganisation of Secondary education the Elementary school became a Junior school. In 1979 the Infant and Junior schools were amalgamated under the Headteacher and became St Joseph’s Primary School. a Junior school. In 1979 the Infants and Juniors schools were amalgamated under the Headteacher and became St Joseph’s Primary School. In 1994 there was an opportunity to move to larger premises at 204, North Road, which had formerly housed St Joseph’s Convent School. The school in Whitchurch Road was sold to the L.A. and became a Welsh Medium Primary School. Whitchurch Road to fill the gap before the new parish schools were ready. However, parents asked for the convent school to continue and it moved to “Oakridge”, in North Road when numbers became too great for the original school. More buildings were added and eventually “Oakridge” house, which had stood in the corner of the present Infants’ playground, was demolished in the late 1970's. The Convent school closed in 1993 and a year later St Joseph’s Primary School “moved in”. looked after God’s own son. Mr. David Massey, son of the former Head of Infants, Mrs. Helena Massey, designed the shield for St Joseph’s Primary School. The design was drawn from those tools associated with the profession of carpentry. This is particularly appropriate when one considers the name of the school. The tools presented in St Joseph’s school shield are the saw, hammer and mace. The S.J. depicted upon the shield was derived from the original Corpus Christi cap of previous years. 2019 is an exciting time of great change for us. Our pupil numbers are increasing and we are building on our recent successful Inspection in 2017 and are busily preparing for the New Curriculum. We are also preparing for our Nursery provision. Our Nursery will open in September 2019. We have a vision and are on our journey.